As some of you may know baking is one of my favorite things to do! I inherited that trait and talent from my mother and to me there is nothing better than putting on an apron and spending some quality time in the kitchen creating. Recently I have had the privilege of making to cakes for three special people in my life. The first cake I made was a gender reveal cake for my best friend, Rebekah, and her husband, John. They brought me an envelope with the gender and my task was to bake a cake and fill it with either pink or blue M&Ms. The theme of the party was 'What will it bee? ', so I took off and got the M&Ms, some sugar bees and yellow sprinkles. Overall I was pleased with how the cake turned out. It was a white cake with lemon supreme icing and yummy! And what was in the middle? Pink M&Ms!!!! You may remember this post from a while back... well you better believe this little girl is going to be a Delta Gamma too if I have anything to say about it! The next cake I made was for my father for Father's Day. My parents and I went antiquing the Friday before Father's day and when I came across a Texas shaped cast iron cake pan I knew I could not pass up that nine dollar deal. 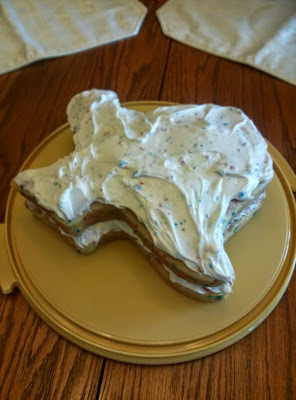 I was thrilled with my purchase and when my father specifically requested Funfetti cake I knew it had to be done in the shape of Texas. After church on Sunday I put my apron on and got to baking. I got the patriotic cake mix, or as us Texans like to think, the 'Texas mix'. It had red, white and blue sprinkles and was perfect! I baked two layers and I have never had a cake turn out more perfect. Each of the layers fell out of the pan so easily and nothing stuck- praise God! Dad loved the cake. It looked wonderful and tasted just as good. 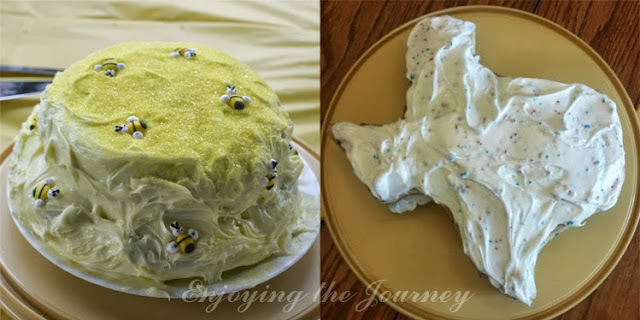 The best part of the whole cake was eating it and deciding which part of Texas to have. Dad had south Texas(from Austin down to Galveston), mom had the Panhandle(the tall part at the top), and I had west Texas(the west part)! I can't believe you found a Texas shaped cake pan! HA! Love it. And the whole deciding what part to eat!? HAAA!!! Okay, so creative and unique - love both of the cakes :) And they look VERY yummy! Both of those cakes are so cute! I love the Texas cake and it sounds so yummy. Nice job!!!! Those both look delicious! !